This collection of new baby quotes will remind you of a small child in your life past or present. There’s just something special about babies. Someone once said, “You cannot buy happiness, happiness is born.” It is perhaps the best way to define the little bundle of love called babies. There is no other feeling that can be compared to having a new baby in your life. When you bring a new baby into this world, it is not just a big event in your own personal life. It is also a big step for entire humanity. Having a new baby is nothing less than the fruition of your very existence. It is one of the biggest steps that you will ever take in your life. Whether you have a new baby girl or a baby boy in your life, it is one of the biggest and happiest moments you’ll experience. Great men and women throughout history have realized and emphasized the importance of this big leap in every human’s life. 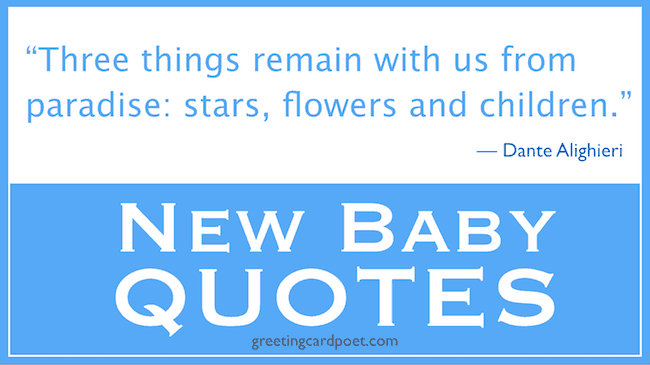 Here are some famous new baby quotes and sayings to make you feel special. In soul of every newborn baby, words are waiting to be written. is to experience a gift from above. ‘Life will never be the same again’. A daughter is just a little baby – By girl who grows up to be your best friend. Baby girls bring us a piece of heaven on earth. When a star falls from the sky, a child sees the light of day. And let him be a little wild. A baby boy makes a mother out of his mom and a father out of his dad. When you hold an infant, hold him not just with your body, but with your mind and heart. All that awesome, in such a little boy. The kind of space your baby boy will take up in your heart, will make you wonder how you never knew it was there in the first place. and a little boy out of his grandfather. There’s nothing quite like little boys. Enjoy the time when your newborn plucks your heart’s strings. It is a feeling that is a part and parcel of the joy that a baby boy brings. most precious to their mothers! Tip: Use these new baby quotes as captions on Instagram and Facebook. The child must know that he is miracle, that since the beginning of the world there hasn’t been, and until the end of the world there will not be, another child like him. Becoming a parent is the moment when all of life’s battles suddenly seem worth fighting for. Life will be full of ups and downs. It will be one tough ride. But your love for your child will be the anchor that will see you through it all. It’s extraordinary to look into a baby’s face and see a piece of your flesh and your spirit. It makes you realize, you are a part of the human race. The coolest part of being parents is catching a glimpse of yourself in your little one. Nursing your newborn will make you realize the real meaning of life. If I am thinking correctly, a new baby is probably, undoubtedly the grandest gift that could ever be. If you have suggestions for new baby quotes and sayings, please let us know via the Contact page. Thanks! You’re on New Baby Quotes and Sayings.